VR and AR are not new. Interactive simulations to train airline pilots and surgeons for example have been widely adopted for a long time. 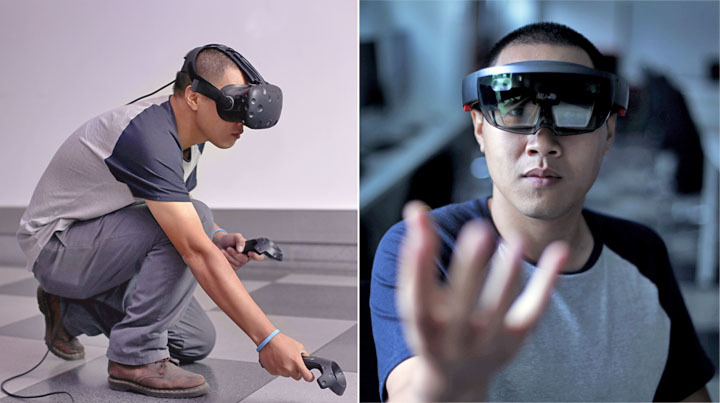 But recent technical advances especially in hardware for visualization (headsets) are now enabling widespread adoption of VR/AR for new applications, at very affordable cost. Huge opportunities are opening-up to incorporate VR/AR into business-to-business and business-to-consumer situations. Analysts are in agreement that this sector is forecast for explosive growth within the next 5 years. The global augmented reality and virtual reality market is expected to reach USD 151.30 Billion by 2022. Forward thinking companies which adopt these opportunities now are poised to reap benefits ahead of the competition. VR totally immerses the user into virtual environments, either computer-simulated or photographically scanned. A head-mounted VR display (headset) fully immerses the user into the virtual world. With AR, the user sees virtual objects or environments superimposed on the real world, and this is experienced using AR headsets or smart glasses. In this way, life-size holograms can be brought directly into the office, for example. Real-life objects can be annotated with superimposed written information, instructions, images, allowing for accelerated decision-making and response. VR and AR enables visualization, marketing, instruction and learning, exploration, interaction, collaboration, decision-taking, and entertainment.